The year of 2015 started with the continuation of the exhibition Revoir Paris, for many fans the biggest event of 2015. The atmospheric exhibition in the cellars of “La Cité de l'Architecture & du Patrimoine” in Paris ended in March 2015. 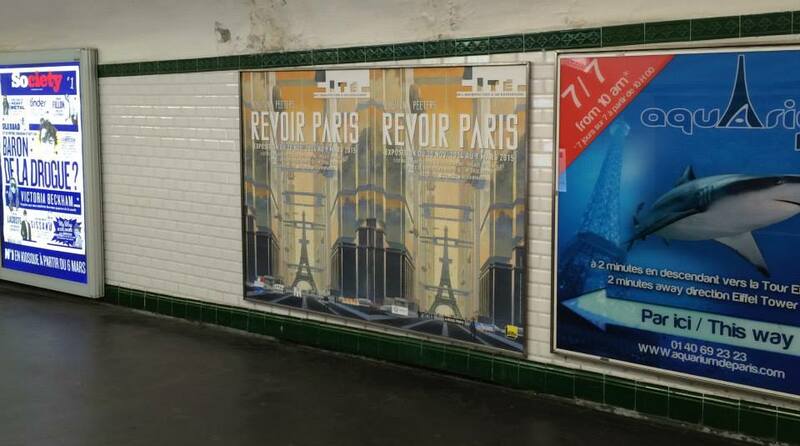 The album Revoir Paris was published in 2015 in several translations: “Volver a París” (Spanish), “Nach Paris” (German) and “Rivedere Parigi” (Italian). Due to the other activities of François Schuiten, the second episode of Revoir Paris is delayed to October 2016. Maison Autrique closed its doors in February 2015 due to renovations. The reopening is scheduled for Spring 2016. In March 2015 François Schuiten decorated a statue of Le Chat by Phillipe Geluck for the La Foundation Erasme, an organization funding medical research. In April 2015 Schuiten joined the Jangada project of Les fauteuils volants. Les fauteuils volants is a non-profit organisation that helps and supports people with disabilities. The association organized on April 25, 2015 a benefit night for the project Jangada. Jangada is a supportive housing project to provide to disabled persons their own housing. Kites were decorated by different artists like Philippe Geluck, Dany, Frank Pé, Alexandre Obolensky, Yslare, and François and Luc Schuiten. Also in April 2015 the San Diego Comic-Con International announced the nominations for the Eisner Awards 2015. Both François Schuiten and the English translation of L'Enfant Penchée, The Leaning Girl by Alaxis Press, received a nomination; but none of these nominations became a winner on the San Diego Comic-Con in July. 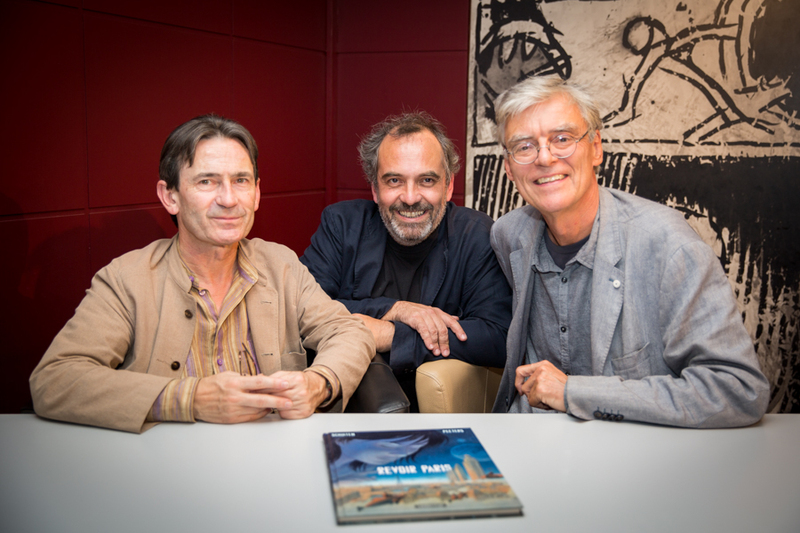 At Paris Se Livre, organized from June 4 until June 6, 2015, in Tour Montparnasse in Paris, Benoît Peeters and François Schuiten received the prize for best book for the book about the exhibition Revoir Paris. François Schuiten and Benoît Peeters did some more projects together like the Conference at the Musée Malraux du Havre and Rêves d'archives at the Mundaneum. But they also had some projects individually. Benoît Peeters published a new book, Raoul Ruiz, le magicien, about the life and work of this famous filmmaker. He visited Salon du livre de Beyrouth and gave lectures in Montreal and at L’Age d’or de la BD. Benoît Peeters was also appointed by Lancaster University as its Visiting Professor in Graphic Fiction and Comic Art, the first ever such appointment in the UK. François Schuiten saw his Aquarica project with Benoît Sokal and Martin Villeneuve come a step closer to realization by the announcement that the film will be produced by ITEM 7 in Canada. In Augustus 2015 Martin Villeneuve announced that SODEC will finance the development of Aquaria. As founder of the HIP.institute François Schuiten was also involved in the Scan Pyramids project, trying to solve the old mysteries of the Egyptian pyramids. A project that started in November 2015. Artwork of Schuiten went up for auction at Sotheby's and Millon, selling for high prices. Starting in October 2015 the Centre de la gravure et de l'image imprimée in La Louviere (close to Mons) held the Lumières sur les Cités exhibition. A great exhibition with the original artwork of La Théorie du Grain de Sable and a nice scenography with changing light, sounds and sand. Another scenography of Schuiten got a lot attention in 2015. After 10 years the museum Train World opened its doors. The scenography is designed by François Schuiten. The old trains, the light, the sounds make the museum to a complete experience. Train world is mentioned by many people as their highlight of 2015. The music of Train World was composed by Bruno Letort. Letort also made the music for the Revoir Paris and Lumières sur les Cités exhibitions. A new album was published with the opening of Train World: La 12 - variations sur l'Atlantique 12, together with an English translation of La Douce, published as “The Beauty”. La Douce is also the main topic of the artwork published by the new publisher Atlantic 12. Some of this artwork was part of the exhibition Schuiten & Obolensky: Trains in Brussels. During 2015 altaplana.be archived all information about François Schuiten and Benoît Peeters. The urbicande.be website by Schuiten, Peeters and Alok Nandi was archived on altaplana.be in May 2015. A comprehensive dossier was made about the history of urbicande.be. In April 2015, Stephan Smith received a passport found by Mitya Suchin. It seems to be an Urbicande passeport for strangers. It is a mystery how this passport reached our world. Two large exhibitions, a new album, new artwork, many meetings and conferences and Benoît and François involved in many projects made it a great year. 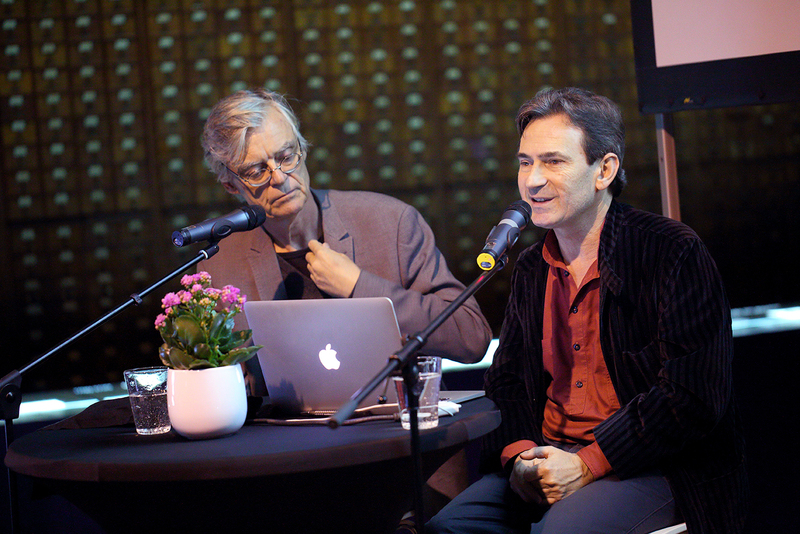 Benoît Peeters, Bruno Letort & François Schuiten during the conference Revoir Paris. François Schuiten: le palais de justice est confronté à une "lente et irrémédiable agonie"
Schuiten redessine La Louvière ! Schuiten to discover the Mysteries of the Pyramids? Benoît Peeters at "L’Age d’or de la BD"
Jiro Taniguchi visiting "Revoir Paris"